Sooner or later in your professional life, you’ll have to give a really important presentation. 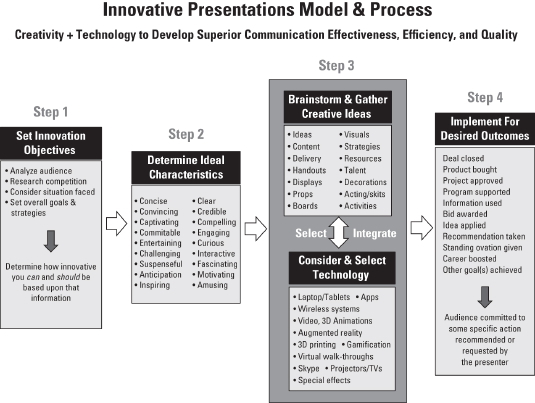 By focusing on several distinct and unique aspects of creating a presentation (topic selection, audience analysis, visual design, and delivery technology and techniques), you can develop the skills to give innovative, stimulating presentations with consistently positive results. At some point, everyone has had to sit through boring, pedestrian presentations. You can’t expect to have a meaningful impact on your audience if you subject them to a run-of-the-mill presentation. So how do you go about reimagining, reinventing, and remaking your presentations? The following figure outlines the four basic steps. Whether presenting as part of a team or alone, asking someone to evaluate your performance during rehearsal can help hone your presentation and skills. Ask a trusted colleague or mentor to watch your presentation — ideally someone who is similar to a typical audience member or can put himself in the audience’s state of mind. After your presentation, the evaluator can either complete this form or give you verbal feedback on the aspects of the presentation. Some of the questions relate to the content, so you can determine if you delivered your desired message, while others are about your specific performance. What was the title of my presentation? What three main points did I make? What is the call to action I want the audience to take? What parts of the presentation were confusing? Did I use any jargon or words that you didn’t know or understand? Which parts of the presentation are too simplistic or contain information that the audience already knows? Were my visuals interesting or boring, helpful or distracting? How did you feel during and after the presentation? Objectively describe me — during the presentation — in two or three words, such as professional, nervous, knowledgeable, warm, confident, cold, unorganized, pushy.